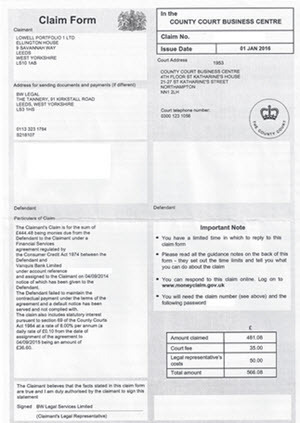 A County Court judgement (CCJ) is a court order obliging you to pay money you ow to a debt. In most cases, the court will set up a payment plan for you to follow. CCJ:s are only used as a part of the debt collection process in England and Wales. In Scotland and Northern Ireland, there are different court process for creditor to utilize. Why am I getting a County Court judgement? You are getting a County Court judgement because you have failed to adhere to the repayment plan for a debt. As a part of the debt collection process, the creditor can turn to a County Court and ask for a County Court judgement. For debts regulated by the Consumer Credit Act, this can only be done after the creditor has sent you (the debtor) a default notice and given you at least two weeks time to get your account up to date again. If you fail to catch up with missed payments within the stipulated time, enlisting the aid of the County Court is one of several venues now available to the creditor. I received a County Court claim form – what now? If you receive a County Court claim form, you have just over two weeks to respond. The exact deadline depends on which court issued the claim. It is important that you fill in the form correctly and respond within the given time frame, otherwise you risk having the court ordering you to pay back the debt at a pace that is impossible for you to afford. There will be four forms included in the County Court claim form pack. Telling them apart will be easy, because the form name will be written at the top and the form number at the bottom. N1 will contain information about how much money you owe. Normally, there will also be a section on N1 called Particulars of Claim where you will find more detailed information about what the debt pertains to. The information you provide in the forms will be used to create a repayment plan for the debt. Typically, the repayment plan will be in the form of monthly instalments. As long as you stick to the repayment plan, the creditor can not take any further actions against you. N.B! There is one important exception: If you own property, the creditor can apply for a charging order to secure the debt against your property even if you adhere to the repayment plan. A charging order turns unsecured debt into secured debt. Within a month of being issued, the CCJ will be added to the Register of Judgements, Orders and Fines. This is a database operated by the Registry Trust company. Information about the CCJ will be in your credit file for six years. In the eyes of most creditors, it will drastically reduce your creditworthiness, even if the debt has already been paid in full.